How fascinating! As I opened the NIV, THE WOMAN’S STUDY BIBLE immidiately following the page used to place who “This Bible belongs to” on is “the Ketubah Marriage Contract”. As I went through the pages, looking for the introduction, I what was once part of many Bibles- “Family History” pages and something new “My Spiritual Mothers”. Wow! This makes this Bible worth buying as: a Bridal Shower gift, a Mother’s day gift, a sweet 16 gift, or a gift to yourself. Today’s Bibles are more than just the presentation of Scripture and editiorials. They serve as introduction to biblical truths. The NIV, THE WOMAN’S STUDY BIBLE presents the Word from a feminine perspective, an important task considering societies push towards asexual identity ideologies. This Bible celebrates being female. Not all women in the Bible are as well known as Esther and Mary. There is the “Levite’s Defenseless Concubine” - Judges 19- her tragic story was discussed on page 380. A warning against paganism is found on page 1085, within as part of a discussion about Solomon: “In recent times, a renewed interest in paganism has arisen amoung many women” and “Christian women must guard their hearts and minds against these influences.” A commentary on Sapphira in the book of Acts, she was a deceptive woman who exprienced the consequences of her lie. 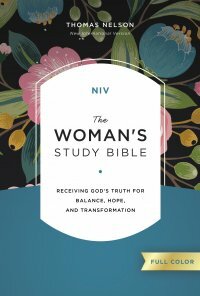 NIV, THE WOMAN’S STUDY BIBLE is filled with a wealth of information. The words included within the pages of God’s word are presented in such a way that the woman who reads it will grow. Without even getting into the actual word I learned something new, the Ketubah.